Recent shutdown of the Small Business Administration has moved small business financing woes into the current media spotlight. It may come as a surprise, however, to know that small businesses have been actively seeking alternative financing options for their growing companies for some time now. Too often, banks are either reluctant to lend to small businesses and don't, or they discourage owners from borrowing through the use of high interest rates and additional fees. More and more, small business owners are turning to alternative sources of financing to fund their companies. Crowdfunding and receivables finance are just two of these alternatives. Crowdfunding is the process of using social networks and other social media to aggregate funds from many individuals to finance specific projects. Usually this requires that the project be identified with a definite purpose and that the profit be shared with the investors or that some other reimbursement is provided. This could be shares of stock in a business or providing product to each investor. Why should your small business consider crowdfunding? Crowdfunding is a great way to finance any small business. Once you have identified a need for funds, crowdfunding offers the chance to request those funds from potentially millions of people. Your small business is afforded the opportunity to receive funding when you need it, even when traditional bank loans are not an option. Another benefit? Obtaining capital from real people can create lasting connections and future business opportunities. What are some of the potential problems of crowdfunding? The problems with crowdfunding tend to be organized around receiving the investment money from the independent investors. With the rising popularity of crowdfunding, several sites have appeared that let you post your project to be funded by the crowd. The problem with this approach is that you are not guaranteed to receive those funds unless certain criteria are met based on each site's respective terms. Even if investors are interested in funding your endeavor, most crowdfunding sites have specific standards for businesses seeking capital. If you don’t meet them, you won’t get funded, regardless of crowd interest. What are alternatives similar to crowdfunding? Another option that allows your business to benefit from independent investors is to participate in receivables financing. Receivables financing is similar to crowdfunding, but is less risky and often offers additional benefits than what a typical crowdfunding opportunity can offer. How is receivables financing similar to crowdfunding? Receivables financing shares a similar quality to crowdfunding in that it allows a greater number of possible investors to invest into a project. This gives your small business greater access to capital that will grow your company. Like crowdfunding, your business is given a platform that allows exposure to a greater number of potential investors than a more traditional route, such as applying for a line of credit or bank loan. 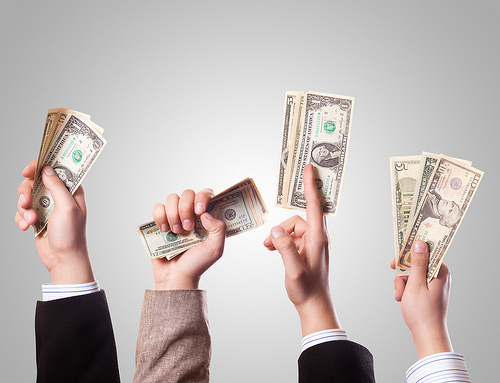 How is receivables financing different from crowdfunding? As crowdfunding is dependent on a non-standardized system, the risk of missed funding opportunities is greater than with receivables financing. With receivables financing, investors are secured from losing any potential money from debunked ideas; small businesses are secured because they receive funds through a receivable financing company, rather than directly from the investor. Receivables financing provides certain security checks that make it more favorable than crowdfunding, and most receivables finance companies will assist businesses in handling their receivables, making working with them less labor-intensive than typical crowdfunding sites. As you look for sources of funds to get your small business going, crowdfunding may be one potential area for capital; however, it can have its unforeseen risks. It would best be to remove these risks by utilizing receivables financing. It provides the same funding power as crowdfunding, but at a reduced risk and with increased benefits. If you are curious for more information about receivables financing and crowdfunding for your small business, please Contact Us.